Many galaxies are clumped together into small groups or larger clusters of galaxies which are bound together by gravitational force. Our own galaxy is a member of the Local Group, shown schematically below. Over 40 galaxies in the group are now known, but most of these are very small compared to the Milky Way. 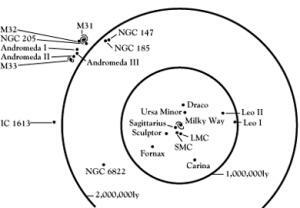 The Local Group contains only 2 large galaxies in addition to our own: M31 (Andromeda) and M33 (Triangulum). The diagram on the left shows the larger members of the Local Group, and their approximate distances from us. Of course the group is really three dimensional, so this picture shows it in projection. On the right is a photograph of M31, which is a little larger than our own Milky Way galaxy, and about 2 million light years away. It can be seen with the naked eye. Several of the small dwarf galaxies which orbit M31 can also be seen in the picture. The largest clusters of galaxies contain thousands of galaxies spanning distances of 20 million light years. These are the largest stable structures in the Universe today. The galaxies in these clusters are moving to and fro under the force of gravity at velocities of around 1000 km/s. An X-ray image of a galaxy cluster looks completely different to an optical image. Instead of individual galaxies, we see one large "blob" of X-ray emission. These two images, show the contrasting appearance of the Coma cluster of galaxies - one of the closest large clusters to us - in the optical and X-ray bands. The X-rays we see are emitted from a sea of very hot (108 oC) gas, through which the galaxies move. The gas is so hot because of the effects of compression and shock waves experienced when it fell into the cluster. The X-ray emission can be used to calculate the total mass of this hot gas, which is invisible in optical images, and it is found to amount to much more than the sum total of the galaxies. In fact, using the temperature of the gas, together with its density, we can calculate the gas pressure, and this can be used to measure the total amount of mass present in the cluster. The result is rather startling. The total mass of a cluster amounts to about five times the total mass in the hot gas plus all the galaxies. In other words, 80% of the mass is in a form which does not show up in any waveband available to astronomers. This is the so-called dark matter, which appears to dominate the mass of the Universe. Scientists still have little idea what this dark matter is. The major galaxies in the Local Group are separated by large distances at present. 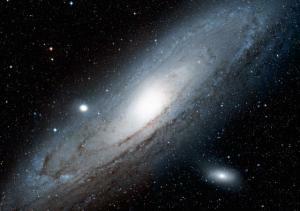 However the group is in the process of collapsing, and in a few billion years our galaxy is likely to interact with M31, and may eventually merge with it. This process can be seen in action in some other galaxy groups at the present time. 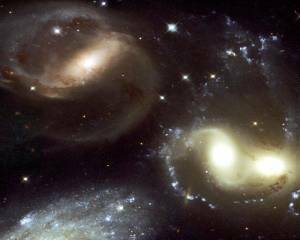 Hubble Space Telescope image of the centre of a very compact group, known as "Stephan's Quintet". Some of the galaxies in this group are strongly interacting with one another at the present time, and will probably merge into one large elliptical galaxy in the future. Like clusters, many galaxy groups also contain hot, X-ray emitting gas. In groups the brightness of this gas is lower than in clusters, and one can see that X-rays are also being radiated from some of the galaxies, especially the ellipticals , which are usually brighter X-ray sources than the spirals . 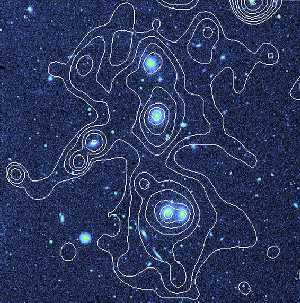 This figure shows an optical image of a group of galaxies, with contours representing the brightness of X-ray emission overlaid. Knots of X-ray emission can be seen centred on many of the galaxies, but there is also a large amount of hot gas surrounding them. 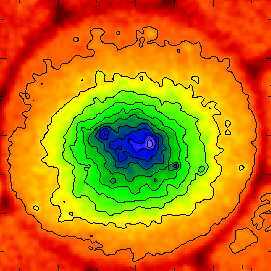 As with galaxy clusters, it is found that there is more matter in this hot (about 107 oC) gas than in the galaxies themselves. 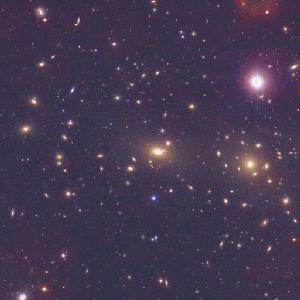 We can also infer the presence of large amounts of dark matter. Astronomers believe that the Universe has developed from the "bottom-up", with small galaxies forming first, and then merging to produce larger ones. In the same way, galaxy groups fall together to make larger clusters. With X-ray telescopes, it is easy to see this process in operation, since many clusters can be caught in the act of merging. This process takes many billions of years to complete, so we cannot watch the merger progressing in any particular cluster. However, we can study clusters which lie at different stages in the merger process, and learn a great deal about physical processes involved. XMM image of a double cluster, known as Abell 399/401, which is in the early stages of merging. Both of these clusters are already very large ones (each about 15 million light years across), so the final merged cluster will be a real giant.